Explanation: Officially the Chandra Deep Field - South, this picture represents the deepest ever x-ray image of the Universe. One million seconds of accumulated exposure time with the orbiting Chandra X-ray Observatory went in to its making. 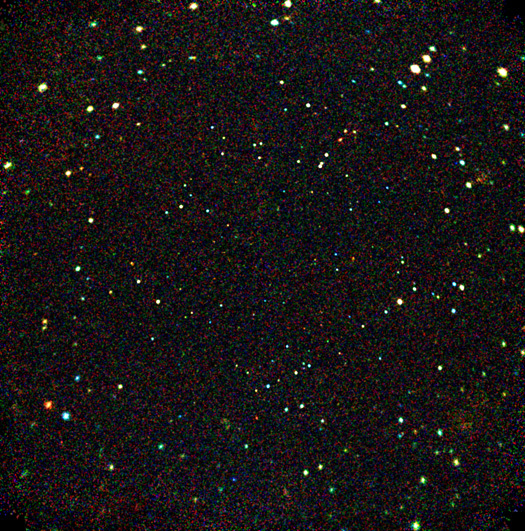 Concentrating on a single, otherwise unremarkable patch of sky in the constellation Fornax, this x-ray image corresponds to the visible light Hubble Deep Field - South released in 1998. Chandra's view, color coded with low energies in red, medium in green, and high-energy x-rays in blue, shows many faint sources of relatively high-energy x-rays. These are likely active galaxies feeding supermassive central black holes and large clusters of galaxies at distances of up to 12 billion light-years. The stunning picture supports astronomers' ideas of a youthful universe in which massive black holes were much more dominant than at present.